Let the Kids Set the Pace | Editor's Note | Kids VT - small people, big ideas! One recent evening, I was doing some weeding in the garden when I found a patch of wild strawberries growing near our fence. I called my 3-year-old son, Oliver, over to show him. Like me, Oliver is a mover and a shaker (meaning we both have trouble sitting still), but our ideas of timeliness differ. I have a schedule, he has a scooter. I like to be on time, he can't even tell time. Sigh. I had been planning to plant seedlings, fix supper, call my brother, fit in a bath ... and so on. But Oliver plopped himself down in my lap, and his excitement at these sweet, hidden treats stopped time. Suddenly the world shrank to that small patch of heaven. I let the rest go. I couldn't tell you how long we sat, and ate, and tickled one another with timothy. It can be hard to see the world from a kid's perspective, but when I make the effort, I'm usually surprised, and always amazed, by the experience. 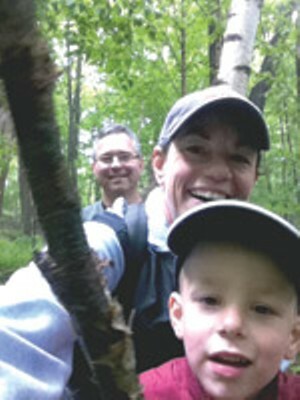 This issue of Kids VT offers lots of opportunities for you to see the world from a child's point of view. This month's Kids Beat includes both the PBS Kids Go! Writers Contest and the Arts Bus Project, which encourage kids' creativity. The fathers who spoke with Erik Esckilsen for "Go Ask Dad" tell stories about how their families have grappled with honesty and truth telling. In her feature about a kite-art show at the BCA Center, Megan James writes about kids making kites and sending their dreams soaring into the sky. Getting in step with your little ones also comes up in this month's mountains and trails installment of the Vermont Day-cations series. If you're going hiking with your kids, the operative words are "with your kids," not "going hiking." Match your pace to theirs, see the trails from their perspective, let them take the lead. It's really about the journey, no matter how far or fast you go.